GM, Chrysler Posted Sharp Sales Gains In September; Ford's Rose Too : The Two-Way General Motors' sales rose 20 percent. Chrysler's were up 27 percent. Ford's rose 9 percent. 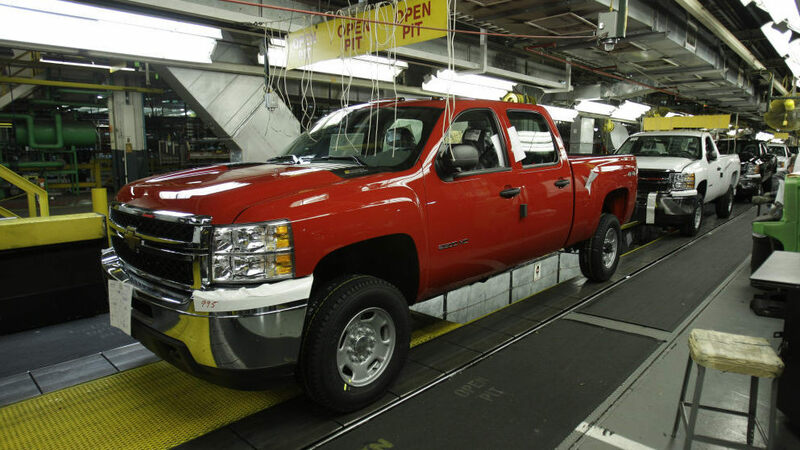 For all three, gains in sales of pickups and SUVs were important. "General Motors Co. and Chrysler Group LLC posted double-digit sales increases in September, defying the prevailing malaise in the economy," The Detroit News reports. "GM reported U.S. sales of 207,145 vehicles last month, a 20 percent increase over September 2010. Chrysler's domestic sales were up 27 percent." The News says that "strong demand for passenger cars, as well as an uptick in full-size pickup sales, helped drive the sales growth at both automakers." "Other automakers will release September sales results throughout the day. Shortages of vehicles from Honda and Toyota combined with troubling economic news to drag U.S. auto sales this spring and summer below seasonally adjusted levels seen in 2010, driving concerns about a stalled recovery. But analysts predicted last month's sales rate rose to 12.8 million, according to a survey by Bloomberg News. That would be the fastest rate since April and well above the 11.8 million rate seen a year earlier." Ford, meanwhile, saw its sales go up 9 percent in September thanks to gains in SUVs and pickups, The Associated Press says. "Sales of the Ford Explorer SUV were more than triple last September, while sales of the Escape small SUV rose 41 percent. Ford's pickup sales rose 15 percent," AP says.